Open, Open reflector, Clear, Compatibility: Based on Housing selection, Clear Alzak. P8015-21A Features: -Open trim. Color/Finish: -Clear alzak finish. Dimensions: -Overall dimensions: 4.5'' H x 7'' D.
This white trim has a 4-inch aperture and open frame. Takes a 65-watt maximum BR30 bulb (not included). This product is a component of a system. Further components will be needed for a complete installation. If you know which components you need, use the "Search" box above; otherwise, click on the Support link above for further assistance. DL # 22862. 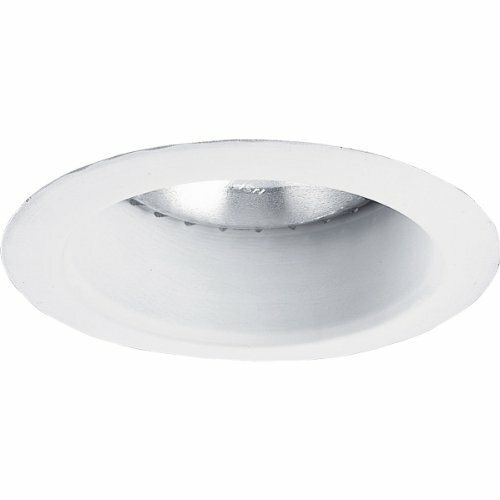 P8115-22A Features: -Open baffle trim. Color/Finish: -Specular gold finish. Dimensions: -Overall dimensions: 5'' H x 9'' Dia. 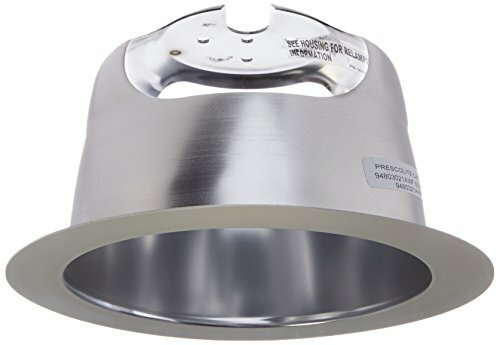 P8368-28 Features: -Air Tight IC and Non-IC.-Notched mounting frame for easy alignment.-Can be installed in ceilings from 0.5'' to 2'' thick.-Nail grip bar hangers accommodate up to 24'' on center ceiling joists.-Slotted interlocking bar hangers provide solid mounting on 24'' centers.-Locking feature to secure housing.-Integral T-bar clamps.-Integral Romex clamps.-UL & CUL listed for damp locations and through wiring.-Rated for 8 #12 90 degree conductors (4 in/4 out).-Trims are easy-in and push-lock into place.-Adjustable lamp position.-5.25'' Ceiling Opening.-7.875'' x 10.75'' Plaster Frame.-5.5'' Recessed Depth.-0.5'' and 0.75'' Pryouts.-Locking clips (furnished) permit quick mounting in ceiling.-Can be installed in ceilings from 0.5'' to 1.75'' thick.-UL and CUL Listed for damp locations.-Rated for 4 #12 90 degree conductors (2 in/2 out).-Rated for 60 degree supply wired in end-of-run applications.-5.125'' Ceiling Opening.-0.5'' Pryouts. Construction: -New Construction.-Shallow profile (5.5'') for 2 x 6 construction. Assembly Instructions: -Meets Washington State Energy Code requirements-P8584-01 Assembly Ceiling Gasket. 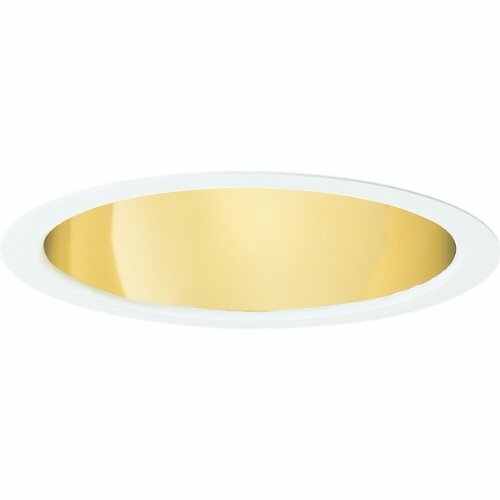 Progress Lighting P8118-22A Features: -Baffle trim. -Specular alzak finish. -Overall dimensions: 5" H x 9" Dia. 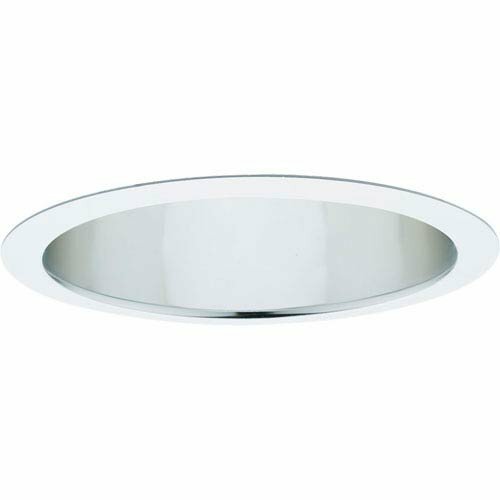 Recessed 6 inch aperture downlight for vertical 26W double twin tube or 26/32/42W triple twin tube compact fluorescent lamp. Fixture is suitable for commercial construction. Insulation must be kept 3 inch from top and sides of housing. Universal input electronic ballast with dimming and emergency options. 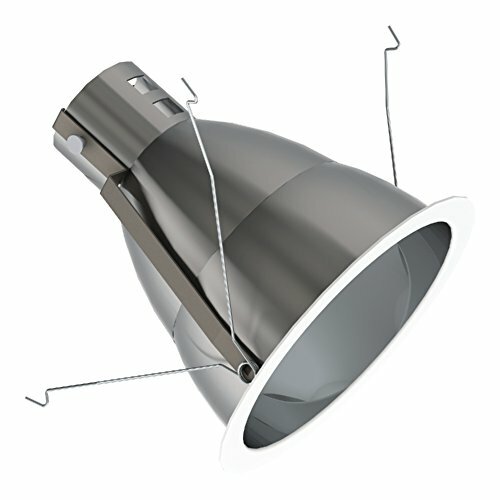 Specify housing and trim separately to complete luminaire. Flange - Bright white powdered painted metal flangeTrim - All aluminum construction - Built-in bracket to accept Trim-Lok spring - Trim-Lok action forces trim to fit snuglyagainst the ceiling - One-piece construction - No light leaks around trim flange - Socket mounts to trim for optimumperformance and consistent lamppositionOptions - Clear Cone - specify â€œ21" after catalognumber - Gold Cone - specify â€œ22" after catalognumber - White Cone - specify â€œ28" after catalognumber - Clear AlzakÂ®Cone - specify â€œ21A" aftercatalog number - Gold AlzakÂ®Cone - specify â€œ22A" aftercatalog number : Duplicate. 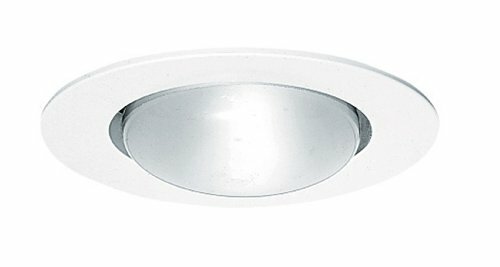 Pro-Optic CFL recessed housings are commercial-grade fixtures that deliver high performance and increased levels of energy efficiency through precision optics. When paired with one of the patented Pro-Optic trims, this system provides great uniformity of illumination, excellent glare control and a great range of control options. With Pro-Optic's wide spacing benefit, you'll get more light from fewer fixtures saving you both money and providing compliance with the strictest ASHRAE standards. Features: -Uses PAR20/R20. -Lamp not included. -Includes: Socket bracket, screws, 3-tension clips and foam gasket. -UL listed. -Product Type: Recessed trim. -Trim Included: Yes. Trim Style: -Reflector. 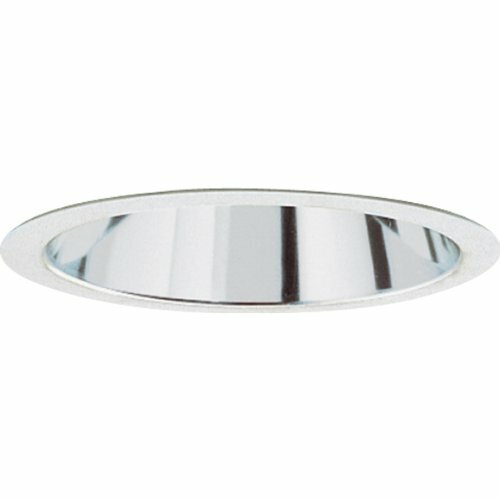 Dimensions: -4" Alzack baffle with white metal trim ring clear and chrome reflector. Overall Height - Top to Bottom: -3.95". Overall Width - Side to Side: -3.95". Overall Depth - Front to Back: -3.95". Overall Product Weight: -0.18 lbs. Specifications: Commercial OR Residential Certifications: -Yes. 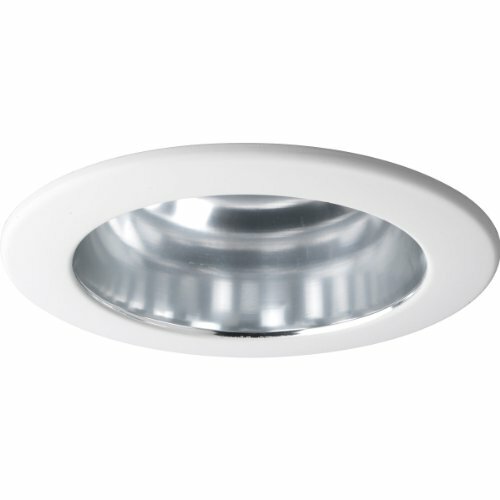 Features: -BR40/PAR40 75W. -Lamp not included. -Certification: UL listed. -Product Type: Recessed trim. -Trim Included: Yes. -Housing included: No. Trim Style: -Reflector. Dimensions: -6" Alzack reflector and white metal trim rings. -Includes: 2 White lexan trim rings (1-ring is 0.5"and 1-ring is 8.7" ) and 2-spring clips. Overall Product Weight: -0.18 lbs. Features: -Can be used as a down light or adjustable 35 degree direction. -Bulb type: 50 W MR16 bulb (not included). -Lamp not included. -Includes: Clear glass lens, 3 tension clips and foam gasket. -UL listed. -Voltage: 12 V. Trim Style: -Reflector. 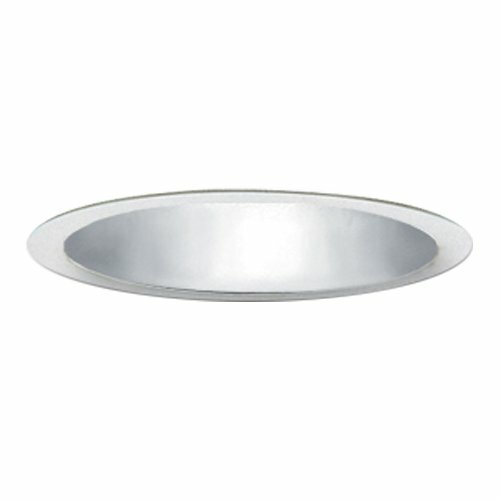 Dimensions: -4" Alzak metal baffle with low voltage white metal trim ring. Overall Height - Top to Bottom: -3.23". Overall Width - Side to Side: -3.23". Overall Depth - Front to Back: -3.23". Overall Product Weight: -0.18 lbs. Specifications: Commercial OR Residential Certifications: -Yes. 14 yards of Carla 12" Classic Medallion and Open Lattice Lace Trim Carla Classic Lace Trim features an elegant medallion and open lattice style appropriate for home décor, fashion apparel, accessories and crafts. The Gold Open Swirl Trim has classical design influences. Its lovely intricate pattern almost looks handmade. The finish is a metallic gold which gives it a beautiful shine. This trim would look fabulous for projects like adorning and edging that require vintage or traditional flair. Even holiday themed projects would look great using this trim. 10 yards of Carla 12" Classic Medallion and Open Lattice Lace TrimCarla Classic Lace Trim features an elegant medallion and open lattice style appropriate for home décor, fashion apparel, accessories and crafts. 5 yards of Carla 12" Classic Medallion and Open Lattice Lace TrimCarla Classic Lace Trim features an elegant medallion and open lattice style appropriate for home décor, fashion apparel, accessories and crafts.